Carefully crafted and nutritionally balanced complete wet dog food for the health and wellbeing adult dogs from 12 months to 7 years. 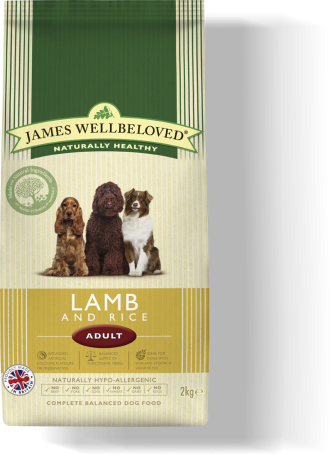 Using all our knowledge and experience, we’ve created James Wellbeloved Lamb & Rice Adult with Rice & Vegetables in Gravy. We take a handful of ingredients from nature, one source of animal protein and combine them with all the vitamins and minerals your dog needs. For added peace of mind, it’s naturally hypoallergenic so less likely to cause an adverse food reaction and you will never see any added artificial colours, flavours or preservatives. Not now, not ever. Additives per kg: Vitamins: E671/Vitamin D3 (150 iu). Trace elements: E1/iron (9.9mg), E2/iodine (0.38mg), E5/manganese (5.4mg), E6/zinc (45mg). Analytical Constituents: moisture 82%, protein 6.0%, crude fibres 0.5%, fat content 4.0%, crude ash 1.2%. 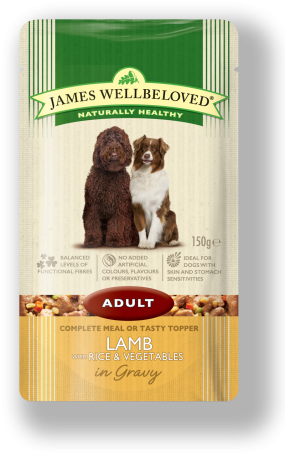 Our dog Flynn loves the lamb and rice pouches with his kibble, he has a sensitive stomach but feeding him James Wellbeloved food has has helped a lot. Dogs have had this for a couple of years now and love it. I really wanted the junior pouch but they only had adult .there is very little fat content so that was ok I give them to my dog as a occasional treat as she has James Wellbeloved dried as she has a sensitive stomache.